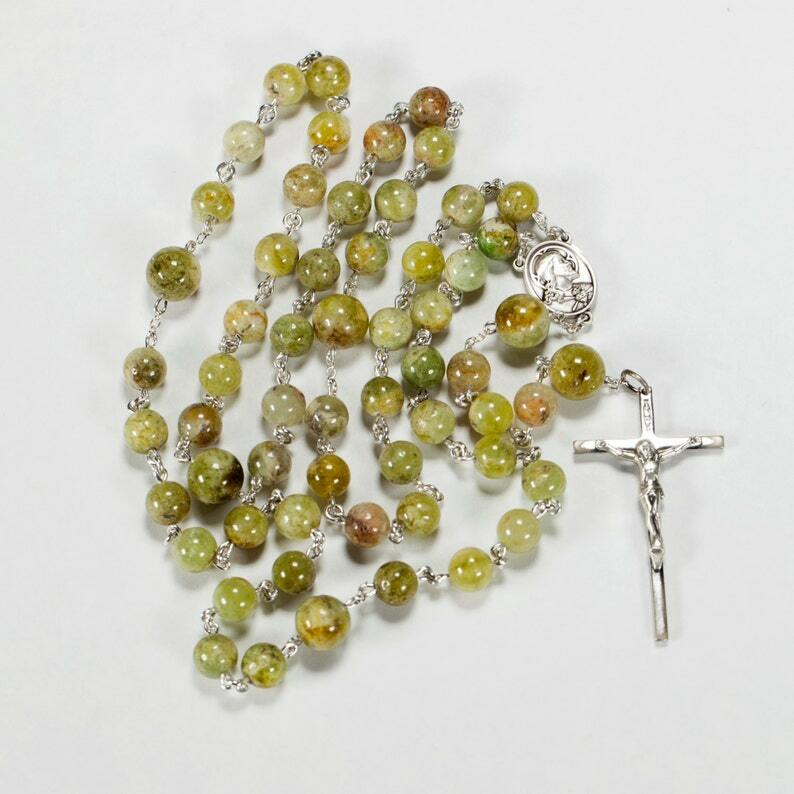 The Hail Mary's are 8mm, smooth round green garnets. 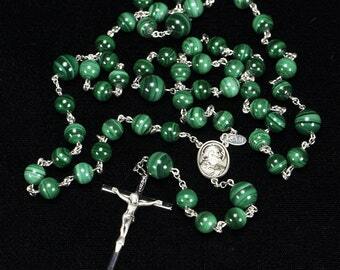 The Our Father's are 10mm, smooth round green garnets. It carries a Sacred Heart of Jesus center and simple 2″ Crucifix. 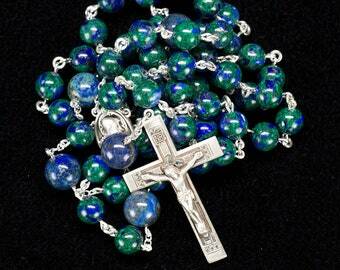 Your rosary will come packed in a velvet lined, handmade pouch and cardboard box with padding. 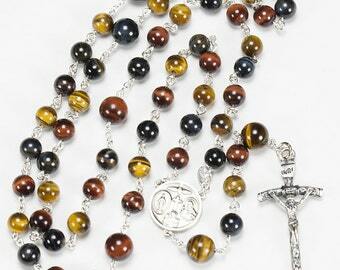 The pouch fabric and colors will vary for each rosary and is my special treat for you. 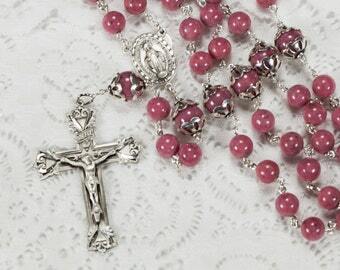 I make custom Rosaries all the time, so if you want something different or specific please do not hesitate to reach out. I personally do not engrave the crucifix, but I can have it done for you for an extra fee. Gorgeous rosary. Perfect confirmation gift for my daughter. Thank you! As stunning as expected, thank you very much! Very beautiful and perfectly appointed. I absolutely love it! 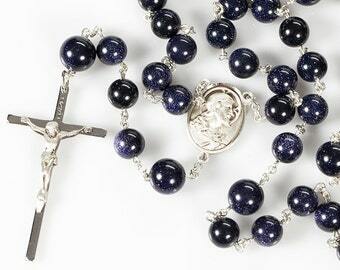 Purchased this rosary for my son, who lost his communion rosary given to him 23 years ago. He only told me about it recently. 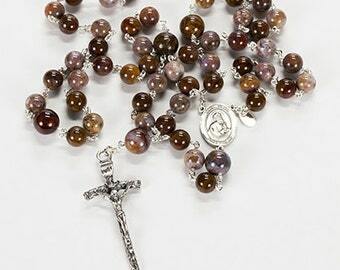 This beautiful rosary looks even better in person and feels really comfortable in your hands. I know my son will be very pleased, I just wish he’d told me this much sooner!!! Thank you, again, Sue Ann for making such a beautiful, one-of-a-kind rosary delivered in such a lovely rosary pouch! Now to our parish priest for a blessing!